This is New Look 6301, and is number six in my 2018 Make Nine and also my #sewtogetherforsummer entry. This is a mock wrap dress with pleats on the bodice, and a straight or flared skirt. It was reader Elaine Willis who put me onto this pattern, and this version was inspired by this amazing version by Mimi G that I came across when I googled the pattern number. My fabric is some poly jersey from The Textile Centre, and I made the sleeveless bodice of View D with the skirt from Views A and B, but lengthened the skirt to maxi length. Also, I left off the waist tie. 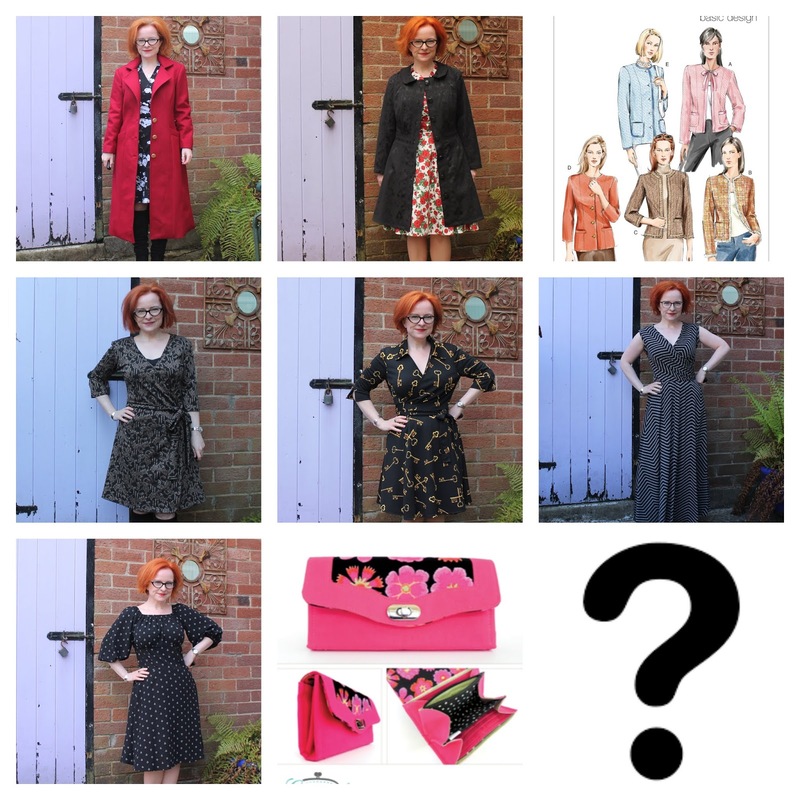 The sizing had me scratching my head, as I should be a size 12, but when I compared the bodice pattern pieces with Vogue 8379 (which I made here in size 12), they pretty much matched with the size 8 - so that's what I went with. I shortened the bodice by 3/4", and took Elaine's advice in the comments in this post, and raised the neckline to the size 18 line. Thank you Elaine - this worked perfectly! Having read a few pattern reviews, the general opinion was that the neckband piece was too long; so I cut it for size 8, and then pinned it while stretching the neckband piece out slightly. If you've made the Tilly And The Buttons Agnes Top, this is how it's done. It worked perfectly, and I then twin-needled the edge down. The waist has a channel sewn into the waist seam for 1/4" elastic, and I love how the bodice pleats look. I wasn't really sure I would like this as I was making it, but it did that magical sewing thing of turning itself into something fabulous when I tried it on! Oh my goodness! This is lovely and makes you look ten feet tall! Thanks Heather! And this is why I love a maxi dress - they have the magic ability to make me not petite any more!!! Wow this looks amazing Lynne. The style suits you perfectly and your stripe fabric creates really interesting lines. I couldn't resist making another one, also in stripes, in a thinnish Ponte. I tried the straight skirt this time and put two pleats in the front in place of the darts, left off the ties and combined it with the short sleeves. I really like how that worked too. I'm definitely making this pattern again, probably an autumn version next! Thanks Elaine! And thanks again for putting me onto this pattern! I love how the print runs on the bodice, and it was a happy accident because I didn't realise that was how the grainline ran until I looked at the pattern pieces. Your dress sounds lovely. I love the idea of pleats instead of darts at the waist. I think this gives a softer look, and the Deer and Doe Belladone skirt has this, which is why I like it so much. You've got me thinking about a winter version now! I think it would make a great winter dress wouldn't it? 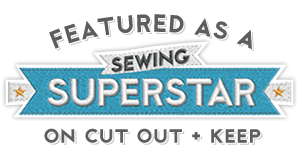 My first one was in a black Isabella wool jersey from Sew Essential. It's quite heavy, drapy and very soft and warm. I hadn't seen the Belladone dress but yes the pleats looked just like that. I'd like to make a graphic print one and also a maxi one after seeing yours! Glad you liked the pattern Lynne! Thanks Sarah! I really love how it's turned out! Thanks Moira! They go together perfectly!! Gorgeous! Great call on extending the skirt to maxi length - it'll be perfect for summer! Thanks Ruth! Wish I could take the credit for the maxi length, but I just copied Mimi G!! Looks fabulous Lynne - and look at your make 9 progress! I think I'm still working on my 9 from 2 years ago!!! Thanks Colette! 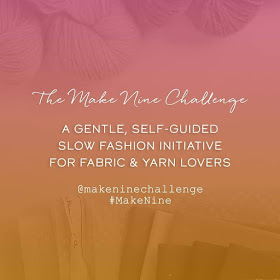 I'm finding Make Nine is brilliant for keeping me focused on stuff that I actually want to make and need. Wow this looks amazing! The length of it is so elegant. I also really like the fabric you used. I saw this over on Instagram but I've come back for a closer look! I just love everything about it. Great fabric choice, perfect fitting, Ideal length.... super stylish! Thanks Janene! I really love it!! That fabric is amazing. It makes me feel a bit tipsy looking at it! What was it like to work with?! Thanks Helen! Yeah, it made my eyes go a bit funny when I was cutting it out, but it was grand to work with. It's a jersey viscose, and I thought it would be a bit slippery, but it was OK.